Write Or Die Makes You Write Or… Else | OhGizmo! I wrote this post in six minutes. This is vastly, exponentially faster than I normally write posts. How did I manage it? Through hard work, dedication, and threats. Mostly the threats, to be honest, thanks (I guess) to a webpage called Write or Die, which aims to combat laziness and apathy by literally forcing you to write. 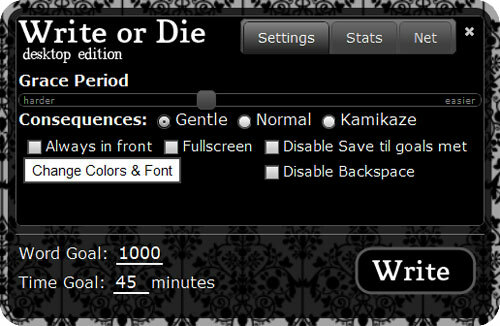 You tell Write or Die how many words you’re trying to get down in how much time, and depending on how strict you want it to be, it will do anything from slowly turning its text box red to playing evil sounds to (in “Kamikaze Mode”) actually deleting your words if it doesn’t think you’re going fast enough. Like, I just had to rewrite that sentence because I went and checked my email for 10 seconds and Write or Die did not approve. For $10, you can get a desktop version, which eliminates the internet as a distraction and gives you the option of disabling saves until you meet your goal. Contrary to Read or Die, this actually makes sense. Hahaha I love the last sentence. This is a great tool to use if you want to get things done. I approve.